The long-awaited Pike Ride has made it to Colorado Springs. 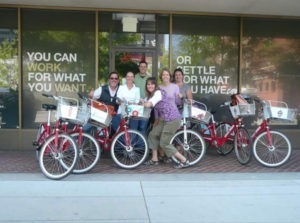 This photograph includes our Director of Urban Design, John Olson, on a 2014 reconnaissance visit with Springs’ leaders to check out Denver’s B-Cycle. Per the photograph, we prefer to work.